One of the great benefits of being on Google Plus daily is you come across some really informative real estate articles. 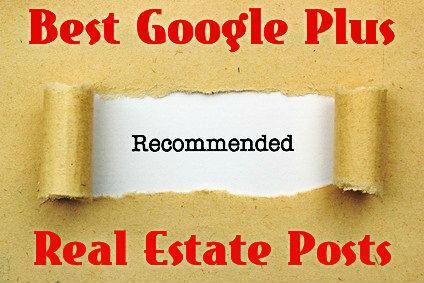 Whether you are just following a great group or Realtors from other parts of the country or participate in some of the excellent Google Plus real estate communities there is always something worthwhile to read. Real Estate is a business that is constantly changing. In addition there are always new buyers and sellers entering the market looking for guidance. What I am going to start doing more often is sharing some of the best real estate content I find on Google Plus. These will be summaries of real estate articles that are worth taking a closer look at. The majority of these articles will be helpful advice centered around buying and selling a home. So without further ado take a look at some of the best articles found on Google Plus for the first week of May 2014. Buying and selling real estate can be very stressful. There are always problems lurking around every corner. One of the major hurdles when participating in a real estate transaction is getting past the lenders appraisal of the property. There are times when a property can be put under contract for a certain amount of money and the appraiser does not agree that this is the correct value. When this happens this causes major havoc for both the buyer and seller. Do you know what to do when a home does not appraise for the contract price? In the article Debbie Drummond does a masterful job of explaining what happens when your property does not appraise for what it should. If you are buying or selling a home and run into an appraisal problem this article is a must read! When you are selling your home one of the most important considerations should be the Realtor you select to get the job done. There are typically thousands of real estate agents to choose from in every market. Unfortunately many homeowners make poor decisions when selecting a Realtor. Often times an agent is selected based solely on some silly reason that doesn’t make a lot of sense. When selling a home your property should look fantastic when it hits the market. It should have no repair issues, it should be clean and tidy, not too cluttered and no off the wall paint colors. In essence a buyer should be able to easily picture themselves in the property. One of the ways to ensure this happens is to hire a professional home stager who can give you guidance. For those that need it this is never a bad idea. Staging can be a powerful weapon in separating your home from the competition. One thing you should never do however is pick a Realtor because they offer to stage your home. There are many real estate agents that offer staging as a value added service. That does not mean they should be chosen to represent your interests because they are providing a service like this. Over the years I have seen countless people make a mistake like this. A top Realtor should have a great track record of success. This includes statistics that go along with their success. What kind of statistics? Look for an agent who prices a home properly. Their list price to sale price ratio should be exceptional. Another important stat is how long it takes them to sell their properties. Are they better than the market averages? Make sure you get a handle on their communication skills. Selling a lot of homes is great but you also want someone who provides excellent service as well. Staging is important but that is not a good reason to hire a Realtor. All the staging in the world will not sell a poorly priced and marketed home! When you set out to sell your home most people would love to see their home sell for the absolute most money. It is a very good feeling when you put your home up for sale and sell your home for more than you expected. One of the ways this is sure to happen is when you are fortunate enough to get multiple bids of your home. From a buyer’s stand point this is an absolute nightmare. You have found your dream home and all of a sudden you find out there is another buyer who thinks exactly the way you do! In real estate multiple offers become far more common when it is a sellers market. With low inventory of homes for sale it becomes far more common for multiple offers on properties to occur. As a buyer there are things you can do to help increase the odds you are the winning bid. Kyle Hiscock does an exceptional job of explaining how you can be the winning bidder in a multiple offer transaction. At the top of most sellers wishes will be the highest bid of course but there are other things that a buyer can do to sweeten their offer. Kyle offers some terrific suggestions to increase the odds you have a good shot at getting the home you really want. These are some of the best real estate posts found on Google Plus for the beginning of May. Using these tips should help your ability to reach your real estate goals. Best of luck! I don’t know much but I hear G+ is losing out on the competition to Facebook. Mara you have been misinformed. Google Plus is one of the best social media platforms especially for business!